There are now 3 of its campuses in the Phoenix area which have received the go-ahead to again take in more children. PHOENIX — The crisis on the border plays out nearly every day in Phoenix. Asylum seekers have been left at bus terminals and churches once they are processed by the U.S. Department of Immigration and Customs Enforcement. Now, Southwest Key tells ABC15 three of its Phoenix campuses are caring for unaccompanied minors who arrive at the Arizona border. Another facility in Tucson is also accepting children. Southwest Key will not say how many children are in its care, but combined, the three facilities licensed in Phoenix have beds for 158 children. Southwest Key spokesman Neil G. Nowlin says, “We are thankful we’ve been able to continue working with immigrant youth that have fled to the United States under difficult and dangerous circumstances. Our staff are providing medical treatment, counseling and educational services." Nowlin says Southwest Key is working quickly to find sponsors for the unaccompanied children. Before touring the border with Vice President Mike Pence on Thursday, Gov. Doug Ducey said he would advocate for more resources. Ducey wants to see more boots on the ground and support for non-profits who are helping deal with the overflow of asylum seekers. But what the Governor really wants is for Congress to fix existing immigration laws, which he feels are contributing to the crisis. "We should be more direct as to what the situation is, and we also have an opportunity to improve our immigration system with reform so it's something people can understand," Ducey said. "They want to be part of the country, they need to understand the process." Southwest Key says it wants to help. Last year, Arizona closed two of its facilities and put restrictions on 11 others because of abuse allegations . 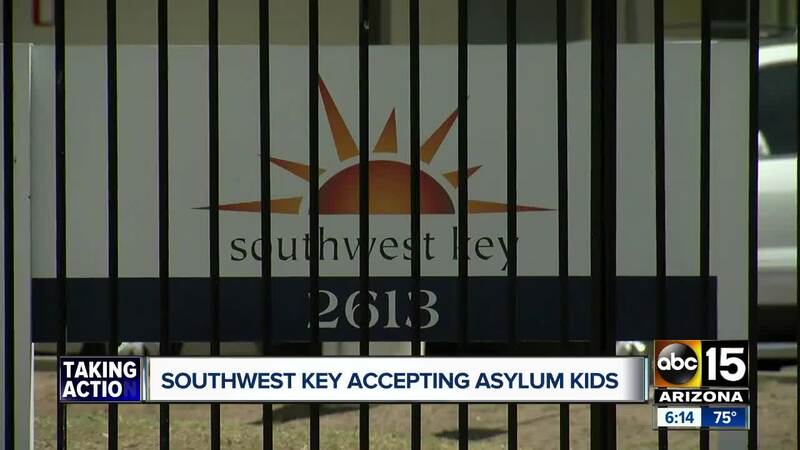 On Thursday through its spokesman, Southwest Key said, "we are proud to be part of a vital network of licensed child care shelters offering compassionate care during the ongoing humanitarian crisis at our southern border."